We started a Dungeons & Dragons campaign with my three oldest kids in June (we have an Obsidian Portal page for the campaign, but it’s in Finnish…) and for the first couple of times we did not use any minis, but then I found some of my old fantasy minis stored in boxes with miniature bitz. I had some old Lord of the Rings and Warhammer Fantasy Battle minis and a few collectible D&D miniatures, but not that many figures for the heroes. First we browsed through the Reaper Miniatures‘ selection and found a couple miniatures that did the job, but then I remembered Hero Forge custom miniatures. I checked their website and it seemed to have a range of selection with all the needed options. 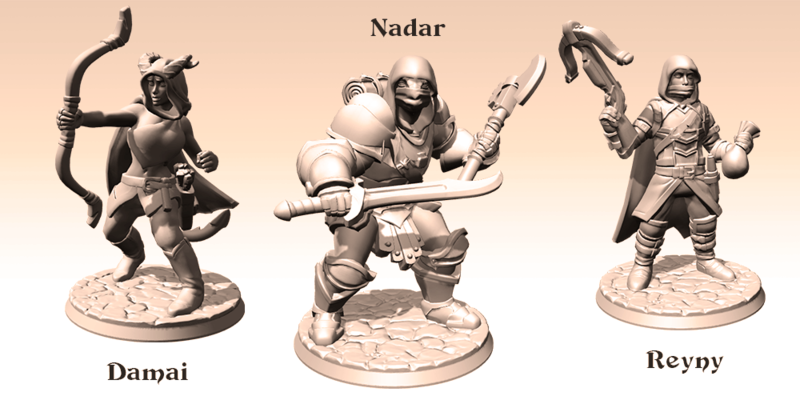 I introduced my kids to the Hero Forge’s 3D editor and they grasped the idea quickly. In no time we had the designs of the miniatures, but also portraits for each of the characters. Damai, a Tiefling Ranger played by my 11 year old daughter. Nadar, a Dragonborn Cleric played by my 9 year old son. Reyny, a half-elf Rogue, played by my 13 year old son. Even though this is not what the editor is actually intended for, it was a pretty handy feature to get screenshots of the characters right out of the editor. We saved the designs and I put in my order for the three minis. This is how the designs done in the editor look like. I selected the high quality plastic as the material, even though I had some doubts with the durability. In the editor, they rate the material as having the lowest durability rating. I was expecting the material to be fragile and not really suitable for tabletop use, but some reviews I found on the internet claimed otherwise. So, I decided to take the risk (Well, at least it felt like a risk at that time). My July was quite busy and I’m not exactly sure how long the figures did take to arrive to Finland. I would say between two to three weeks. I was prepared to handle the customs for the delivery, but as a nice bonus the figures were shipped from Netherlands. So, as the shipping was done inside EU I was spared from the extra hassle with the customs. This was a very nice surprise indeed! The minis arrived in a box with each mini carefully wrapped in bubblewrap and they all were in prime condition. I had seen pictures of the high detail plastic figures and they seemed a bit funky because of the transparent material and the details did not stand out very well, but the material seemed much more durable than I had thought. I had no problems in handling them in the same manner I usually handle my miniatures. Here’s how the miniatures looked like straight out of the packaging. Before I would paint the miniatures for my kids, I had to do some preparations. I washed the figures in a soap and water solution to remove any residual chemicals from the manufacturing process. I did not rub the figures. I just put them in warm water with some dish washing soap and stirred it lightly. Then I washed the figures in running water and let the figures to dry. After they had dried, I gave them a quick gray primer coat with an Army Painter spray paint. The miniatures after a gray primer coat. After the primer coat the details in the figures stood out better and they actually looked pretty nice. There was just enough detail for my taste and there seemed to be no need for any kind of filing or trimming. They were straight away ready for painting. We were supposed to play D&D again in the evening and I wanted to surprise my kids, so I woke up early to paint the figures. I gave them a fairly quick paint job and added a little details to the base. I used both Games Workshop’s Citadel miniature paints and Vallejo’s Model Air range paints. Both paints worked well with the minis (I did not expect any problems anyway) and they were as easy to paint as any other figure I had painted before. I haven’t had painted any minis in a year or so, so it took a little warming up at first, but in the end I was quite happy with the end result. And most importantly my kids really loved the figures. They had now custom made, self-designed figures for our gaming evenings. The miniatures after 3-4 hours of painting. So, this was the first time for me I ordered the figures from Hero Forge, so I cannot say how things are handled if I ordered 10 or more figures, but my impression of how things worked was good. The figures were actually less fragile than I expected and the level of detail and overall quality was really good. All in all the whole concept of being able to order a custom made figure online by using an easy-to-use browser based editor is pretty damn awesome. The high detail plastic figures cost a bit over $20, so they are not cheap, but I would imagine that it’s not a big investment from your players to get a custom miniature to represent their characters (especially for long-running campaigns). You can of course make a conversion yourself, if you are into that kind of stuff, but the Hero Forge editor saves you the trouble of finding the fitting figure and parts from your bitz box or other online bitz stores. I will definitely order more miniatures from Hero Forge in future and fully endorse their service. Thanks for the review. I’ve been wondering how detailed and durable the minis were. I’ll be ordering. “The high detail plastic figures cost a bit over $20” is that $20 each? Now, they may have upgraded the material since I backed with the kickstarter, but I have to say that the minis I received broke in the first day of normal usage. I contacted them and their recommendation was super glue, although they did send out one new mini. Which proceeded to break by the next day. Hope they’ve improved the process, but there is no way I’ll ever get their product again.